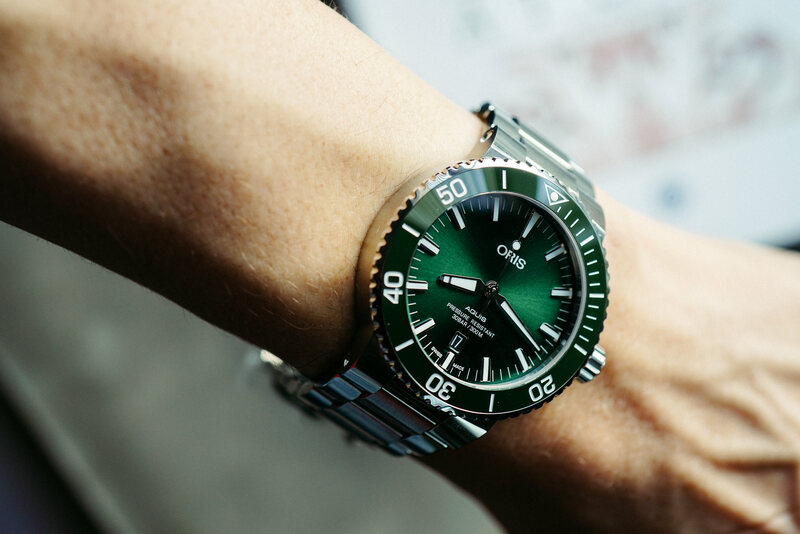 The Oris Aquis has had an exciting road, as the independent Swiss brand's flagship dive watch, since its inception in 2011 as the modest TT1 Diver. Since then, we've seen two generational revisions, a slew of colorful offerings, and an increasingly interesting range of complications and philanthropic special editions. 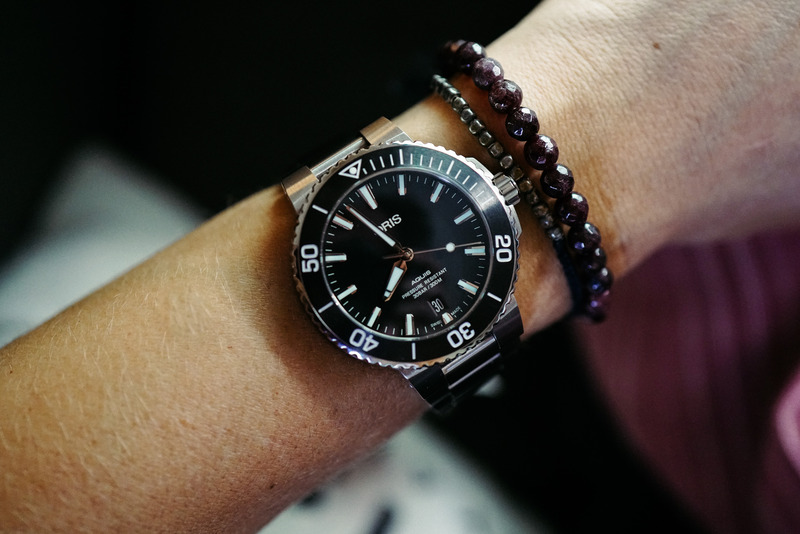 Now, even since 2011, the Aquis (and by extension, its predecessors) has primarily been available in a single case size: 43.5mm – until this year. The new 39.5mm Aquis Date follows all the same design cues from the recent 2017 collection refresh (here's a detailed overview of those updates), which include a new case profile, a new dial and handset, and a new bracelet. All of these changes dialed back the chunky design language of the outgoing variant, and yielded a sporty, but much more svelte dive watch that's already been a hit around Topper. These welcome changes are amplified even further with a smaller case, which should please many fans who loved the Aquis aesthetic, but found the 43.5mm standard case too modern for their tastes. It's not uncommon for savvy Swiss brands to offer more than a single size of one of their iconic designs, enabling them to be worn by either a wider range of wrists, or for those whose tastes tend to lean towards a very specific size. 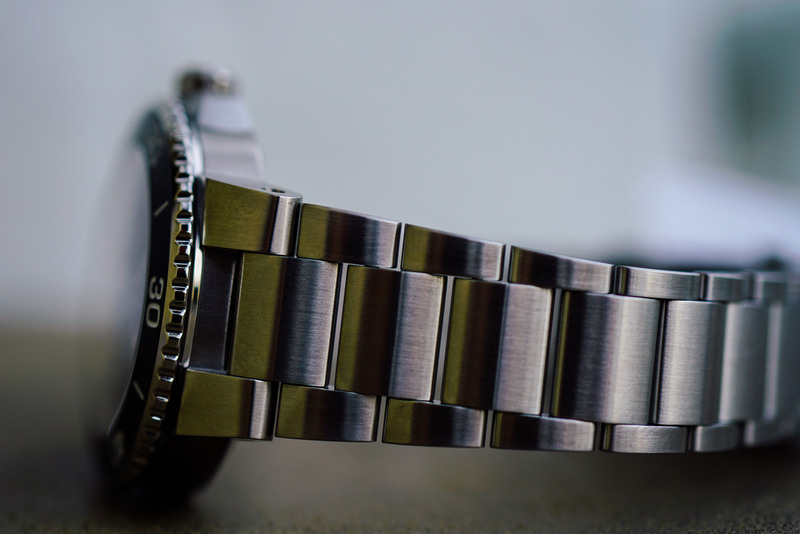 Omega has been doing this with all of their Seamasters for a number of years with 'mid,' standard, and 'XL' options. They've continued this trend most recently, by introducing a 39.5mm Planet Ocean (which we compared right here) to the Seamaster range. Now, it bears repeating that the 43.5mm Aquis was never a 'big' watch, by any stretch of the imagination. Its downward-curved integrated lugs and modest 50.5mm lug-to-lug measurement ensured the watch wore comfortably on a wide variety of wrists. 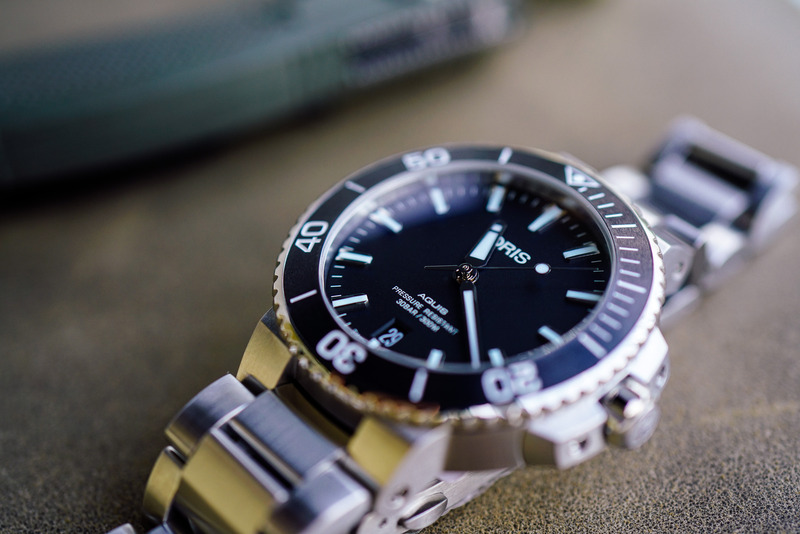 For the new 39.5mm Aquis, collectors are simply presented with an excellent option that more efficiently bridges the gap between the standard 43.5mm case, and the 36.5mm women's-specific 'Diamonds' variants, for those looking for more traditional proportions, while still maintaining the handsome, and now-classic Aquis aesthetic. The new 39.5mm Aquis maintains the 14mm thickness of its 43.5mm brother, while reducing two other key measurements: the dial diameter which goes from 34.5mm to 31mm, and the lug-to-lug length, which is now a very restrained 47mm. The bracelet still maintains the graceful taper and surprising thinness throughout, thanks to the general Aquis revisions of 2017. But what do all those numbers mean outside a direct comparison with the larger Aquis? Well, Rolex isn't a brand Topper carries, but since the Submariner No Date ref. 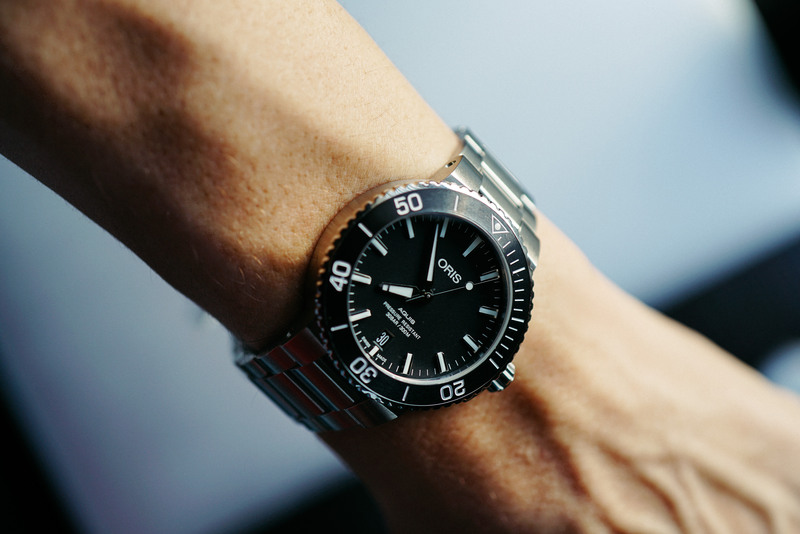 114060 is something of a universally known, comparative entity, it measures 40mm by 12mm thick, and has a 48mm lug-to-lug measurement, making the new 39.5mm Aquis a very classically-proportioned dive watch indeed. 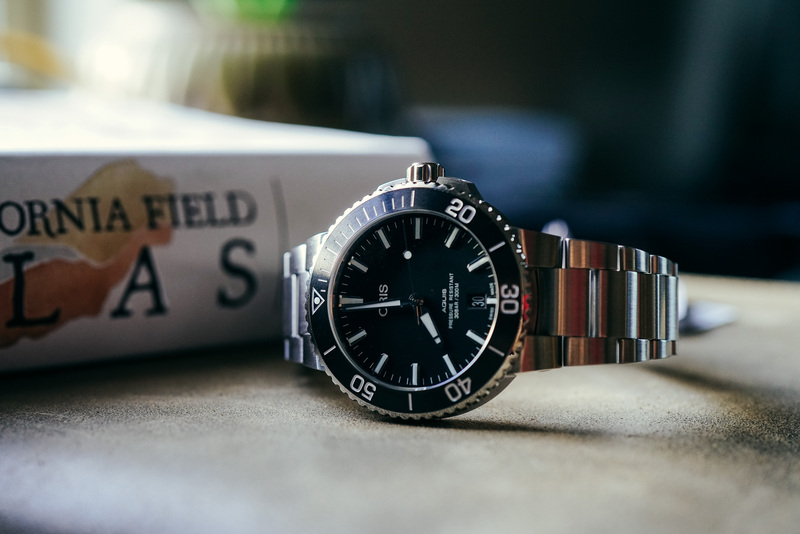 A comparison that might be a little more known to longtime Topper clients, would be the classic 42mm Omega Seamaster Planet Ocean, which has a slightly wider cushion-esque case, but a similar thickness, lug-to-lug, and near-identical dial aperture to the 39.5mm Aquis. 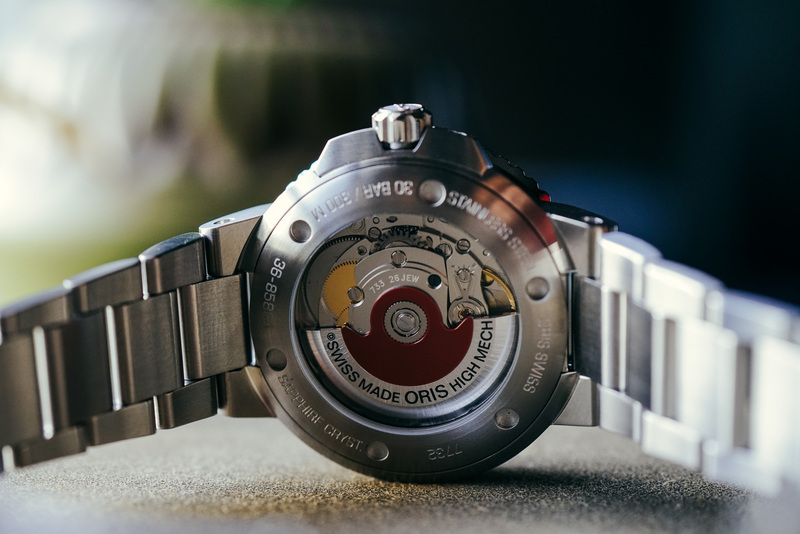 Inside the smaller Aquis Date, beats the Oris 733 automatic caliber – a Sellita SW 200-1 clone, and the same movement used in its larger 43.5mm brother. Noting the signature red rotor, the view through the exhibition caseback is otherwise identical, save for the slightly narrower, threaded stainless steel ring whereupon the watch information is engraved, which encircling the crystal aperture. With a date window at 6:00, this 28-jewel movement carries familiar chronometric performance – 38 hours of power reserve, and an oscillation rate of 28'800 vibrations per hour, or 4 Hz. 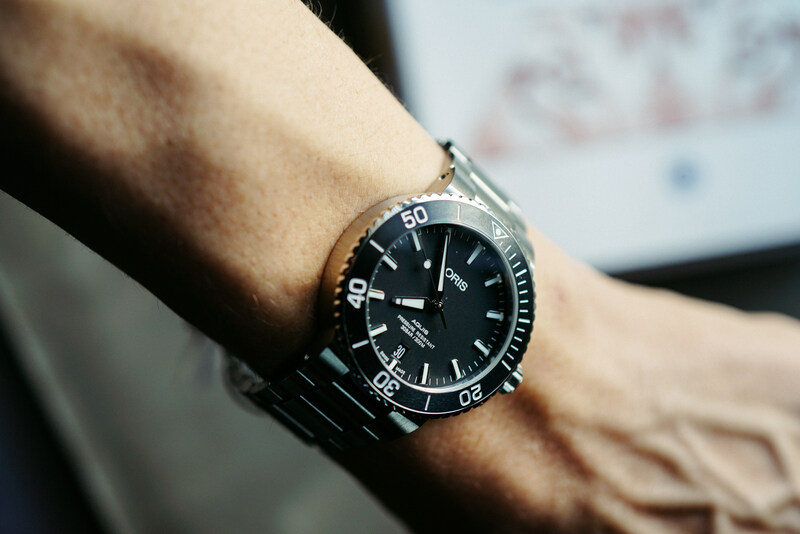 Thanks to its good looks and classically reserved proportions, the new 39.5mm Aquis is sure to be a new fan-favorite – particularly amongst the conversation around dive watch icons. 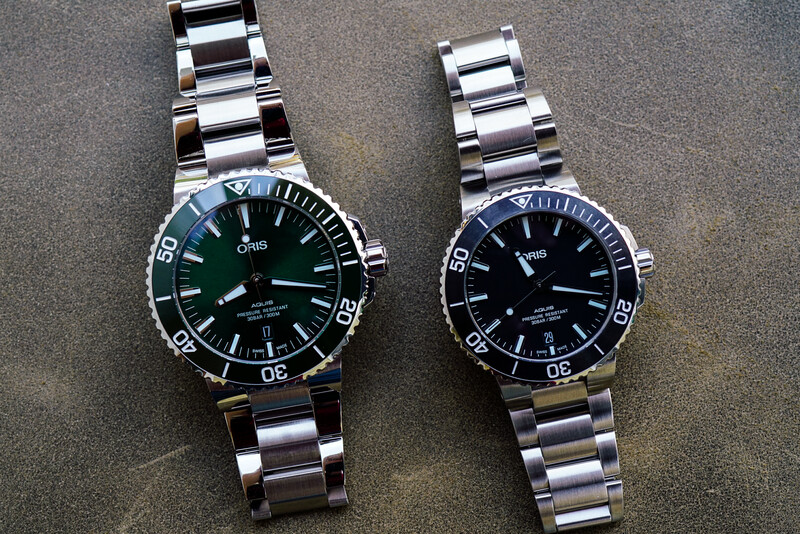 This growing Oris Aquis collection is one of our favorite topics of conversation at Topper, so if you have any questions about the new sizes or one of the limited edition pieces, or you're simply ready to order your own, get started by browsing our offerings here, or inquire by emailing info@topperjewelers.com. We'd be happy to hear from you directly as well – feel free to call us at 888-730-2221. 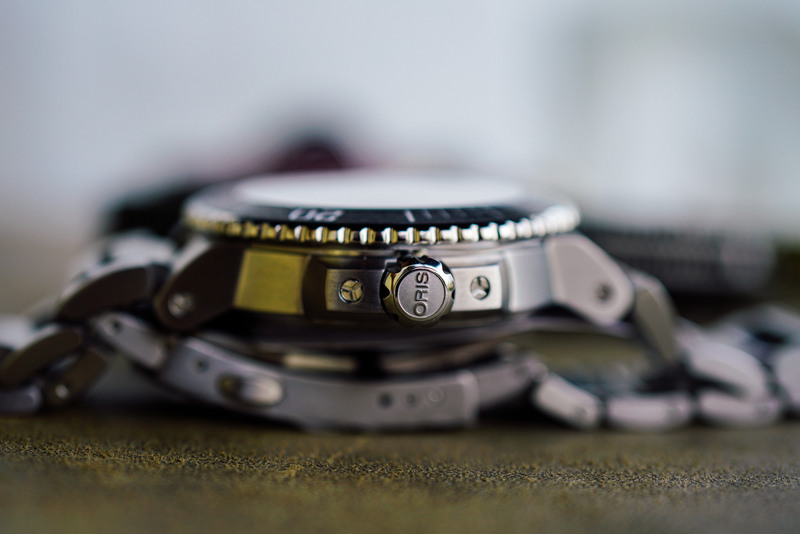 Photos by ablogtowatch contributor Zach Pina. Be sure to give him a follow here.